David Cameron was facing political embarrassment last night after a leading member of the local hunt he has ridden with was charged with illegal foxhunting. Julian Barnfield, 47, the professional huntsman with the Heythrop hunt, will appear before magistrates next month on two counts of unlawfully hunting a fox. The prosecution, which is being brought by the RSPCA, will reopen political divisions over hunting and increase pressure on Ministers to overturn the ban introduced by the Labour Government in 2004. The Prime Minister has ridden with the Heythrop six times and the hunt is popular with fellow members of the Chipping Norton Set – an influential group of MPs and media professionals who live close to the Oxfordshire market town. Prominent supporters include Rebekah Brooks, the former chief executive of News International, and her husband Charlie. Top Gear presenter Jeremy Clarkson has allowed the hunt to ride on his land. Several leading members of the local Conservative party are also members of the hunt and in the past Mr Cameron has been keen to declare his support. In 2003, he described the then proposed ban on hunting as ‘illiberal and bossy’. He also recalled a day out with the Heythrop, saying: ‘Nothing had prepared me for the sheer terror of a day’s hunting. I battled in vain to control my powerful steed and careered through trees and bushes ¬completely out of control. ‘Trying to hover at the back of the field, I ended up at the front as a fox broke cover from behind. In their 2010 manifesto, the Conservatives promised a free vote in the House of Commons on whether to overturn the ban, but many political insiders doubt it will happen. They say the Liberal Democrats are opposed to the proposal, and earlier this month. The Mail on Sunday revealed that a growing number of younger female Tory MPs, called the ‘Blue Foxes’ are also against any plans to lift the ban. 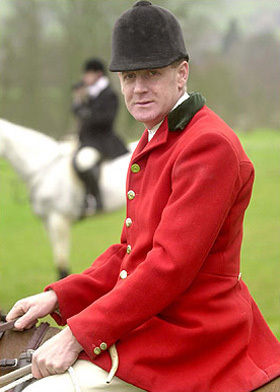 Barnfield, who is a fulltime employee of the hunt and a friend of Mr Cameron, is a fierce opponent of the hunting ban. Before its introduction, he said: ‘I will not stop. I am proud of what I do.’ In a subsequent edition of the Heythrop Hunt magazine, he listed ‘hounds in full cry’ as his favourite music and said his preferred hobbies were stalking in Scotland and hunting mink in Ireland. This is not the first time the huntsman has been charged with offences under the controversial legislation. In 2008, he became the first person in the country to be prosecuted by police for allegedly killing a fox. But the CPS withdrew the charges following a High Court ruling which made a distinction between searching for a mammal and actively hunting it. The RSPCA’s case is based on video footage of the Heythrop hunt gathered by anti-hunt monitors. Barnfield in particular and the Heythrop in general have become regular targets for monitors since the hunting ban was introduced. Barnfield’s solicitor Tim Hayden confirmed his client was due before magistrates. But he said he was unable to comment further until the RSPCA had disclosed full details of the case to his client.